Today I was awarded a Chester Miller Fellowship to travel to the Netherlands and ride a bike (weather permitting) from Amsterdam to Rotterdam. 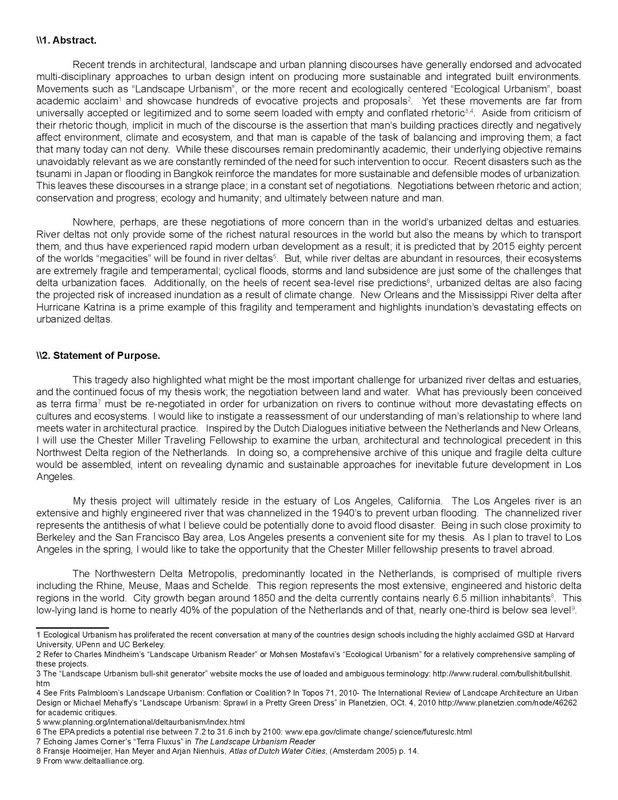 The proposal is a reformat of my earlier Branner Traveling Fellowship proposal. I'm really excited and appreciative to the Chester Miller Foundation for their support in my thesis research. Recent trends in architectural, landscape and urban planning discourses have generally endorsed and advocated multidisciplinary approaches to urban design intent on producing more sustainable and integrated built environments. Movements such as “Landscape Urbanism”, or the more recent and ecologically centered “Ecological Urbanism”, boast academic acclaim and showcase hundreds of evocative projects and proposals. Yet these movements are far from universally accepted or legitimized and to some seem loaded with empty and conflated rhetoric,. Aside from criticism of their rhetoric though, implicit in much of the discourse is the assertion that man’s building practices directly and negatively affect environment, climate and ecosystem, and that man is capable of the task of balancing and improving them; a fact that many today can not deny. While these discourses remain predominantly academic, their underlying objective remains unavoidably relevant as we are constantly reminded of the need for such intervention to occur. Recent disasters such as the tsunami in Japan or flooding in Bangkok reinforce the mandates for more sustainable and defensible modes of urbanization. This leaves these discourses in a strange place; in a constant set of negotiations. Negotiations between rhetoric and action; conservation and progress; ecology and humanity; and ultimately between nature and man. Nowhere, perhaps, are these negotiations of more concern than in the world’s urbanized deltas and estuaries. River deltas not only provide some of the richest natural resources in the world but also the means by which to transport them, and thus have experienced rapid modern urban development as a result; it is predicted that by 2015 eighty percent of the worlds “megacities” will be found in river deltas. But, while river deltas are abundant in resources, their ecosystems are extremely fragile and temperamental; cyclical floods, storms and land subsidence are just some of the challenges that delta urbanization faces. Additionally, on the heels of recent sea-level rise predictions, urbanized deltas are also facing the projected risk of increased inundation as a result of climate change. New Orleans and the Mississippi River delta after Hurricane Katrina is a prime example of this fragility and temperament and highlights inundation’s devastating effects on urbanized deltas. This tragedy also highlighted what might be the most important challenge for urbanized river deltas and estuaries, and the continued focus of my thesis work; the negotiation between land and water. What has previously been conceived as terra firma must be re-negotiated in order for urbanization on rivers to continue without more devastating effects on cultures and ecosystems. I would like to instigate a reassessment of our understanding of man’s relationship to where land meets water in architectural practice. Inspired by the Dutch Dialogues initiative between the Netherlands and New Orleans, I will use the Chester Miller Traveling Fellowship to examine the urban, architectural and technological precedent in this Northwest Delta region of the Netherlands. In doing so, a comprehensive archive of this unique and fragile delta culture would be assembled, intent on revealing dynamic and sustainable approaches for inevitable future development in Los Angeles. My thesis project will ultimately reside in the estuary of Los Angeles, California. The Los Angeles river is an extensive and highly engineered river that was channelized in the 1940’s to prevent urban flooding. The channelized river represents the antithesis of what I believe could be potentially done to avoid flood disaster. Being in such close proximity to Berkeley and the San Francisco Bay area, Los Angeles presents a convenient site for my thesis. As I plan to travel to Los Angeles in the spring, I would like to take the opportunity that the Chester Miller fellowship presents to travel abroad. 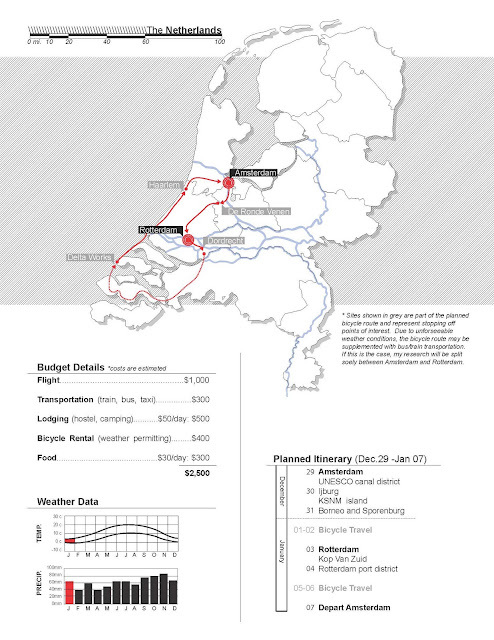 The Northwestern Delta Metropolis, predominantly located in the Netherlands, is comprised of multiple rivers including the Rhine, Meuse, Maas and Schelde. This region represents the most extensive, engineered and historic delta regions in the world. City growth began around 1850 and the delta currently contains nearly 6.5 million inhabitants. This low-lying land is home to nearly 40% of the population of the Netherlands and of that, nearly one-third is below sea level. Due to industrialization and the need for consistent dry land used for agriculture authorities “polderized” much of the Netherlands, which is to open large plots of land from underneath standing water by enclosing them in networks of dykes and levees. As a result, nearly 3,500 polders exist in the Netherlands today. In this respect, almost the entire landscape of the Netherlands could be considered artificial. This places enormous portions of the country at perpetual risk of inundation and requires extensive defensive systems to ensure inundation does not occur. Due to the extensive care given and pristine condition of these systems, much of the population is unaware of the extent to which the land which they occupy has been engineered. This presents an interesting position in which the technologies are so sophisticated that they actually reduce the local working knowledge of inundation defense techniques. Due to it’s long-standing and dynamic relationship to the water, much is to be learned from researching this delta. A myriad of sophisticated water-related building practices are represented here; there are some 16,000 floating homes in Amsterdam alone. My research will focus on the defensive strategies implemented throughout the Netherlands. I will perform an intensive typological study, resulting in a deeper understanding of potential strategies of defense for other endangered urbanized rivers. Due to a large bicycle infrastructure, I plan to bicycle along the polders and canals, from Amsterdam to Rotterdam, to get a intimate look at this amazing landscape. As climate change becomes more commonplace in design discourse, a method of understanding and communicating it’s effect becomes increasingly necessary. Change itself is something difficult to record by traditional methods of architectural representation, and in the case of climate change, projective analysis also is complicated by indeterminacy and uncertainty. During my own research process, I am constantly confronted with conflicting data regarding climate change, reinforcing the fact that much of the research remains speculative. Rather than perceive this as a deterrent, I find this fact liberating for my own speculative process. Indeterminacy and conflict will allow a more radical approach to data communication, and result in a negotiation of sorts between fact and fiction. This provides the opportunity to explore representational drawing techniques which will be applied in my thesis drawings. My primary intent then is to gather relational and contingent data, opposed to terra firma based knowledge. How does water relate to land in different ways? How does architecture mediate between water and land? What are the differing cultural effects of a close proximity to water? What types of negotiations are we involved in? Detail drawings will be pivotal in understanding and communicating the architectural and material implications of inundation as well as the subtle systematic differences. Images will be directed towards artistically revealing unexpected conditions and relationships. Subject matter will contain both built objects and human interaction with the architecture/built form. Beyond graphic and historic data collection, I plan to a gather local folklore also. By means of audio and video recordings, I will interview, at random, locals that I encounter. My intent is to assemble the affect related to the effect of inundation. Local memory of specific floods, building practices and land uses will provide real-world accounts that mere observation could not.